As a movie maker, you want your audience to be as broad as possible, and this includes hearing impaired folks! But as talented as you are with respect to moviemaking, you don't know a thing about how to introduce movie captions to your films. Well, today, you can stop trying to learn and just pick up a copy of MovieCaptioner! MovieCaptioner is an easy way to add captions to your movies quickly and accurately! With MovieCaptioner, just load your movie and start adding captions to match 4 second loops that play at the press of a button. Then, once you're done, export your captions to one of 19 different formats, ensuring that no matter where your movie goes, the captions will go along with it! There's a reason why so many government agencies, universities, and television show production companies are already using this fantastic tool. 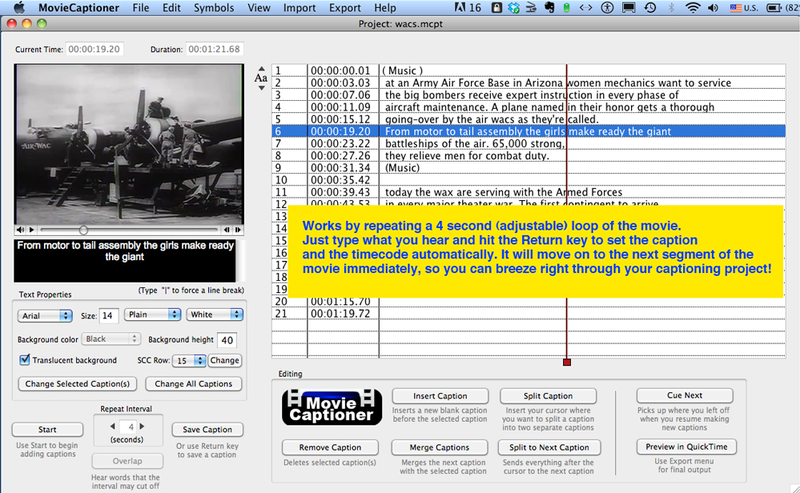 In addition to captions, you can also use MovieCaptioner to import existing transcripts as captions, and existing caption-formatted files while preserving the timecode! Please note: MovieCaptioner requires Mac OS X 10.5 (or better) and QuickTime 7 must also be installed (available on your Snow Leopard install disk). Upgrading to QuickTime 7 Pro will be necessary in order to export embedded caption formats. Add captions to your movies quickly and accurately. Get started quickly by entering captions to match 4 second loops of video. 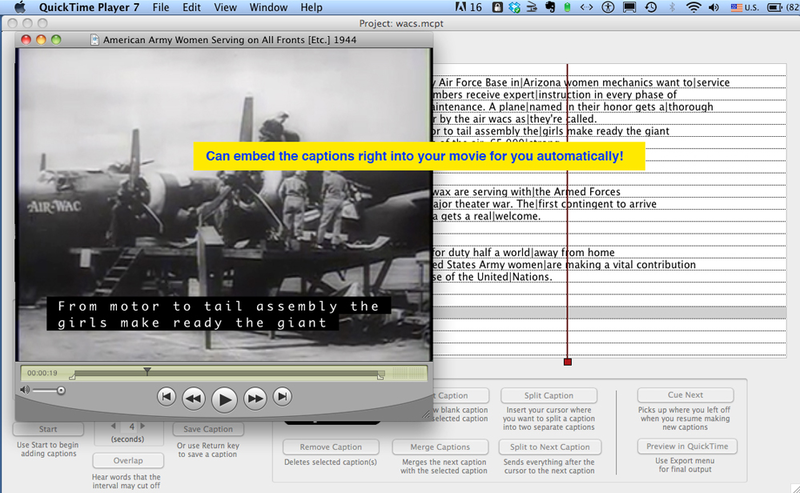 Export captions to any one of 19 different formats. Import existing transcripts and caption files. 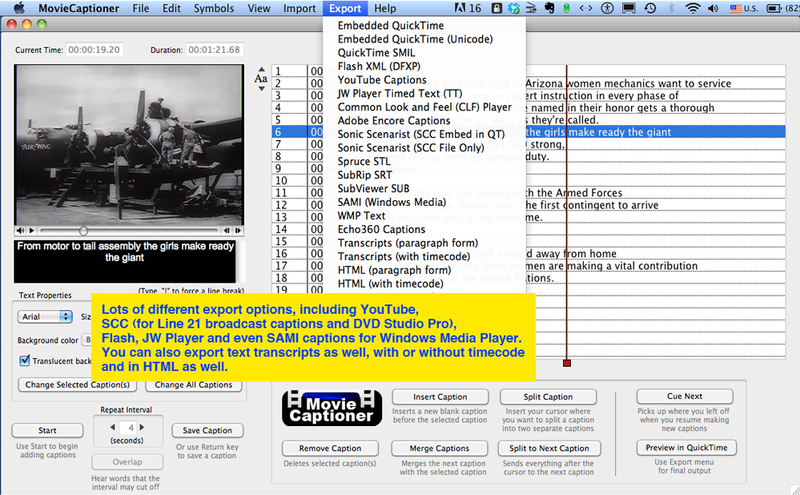 Preserve the timecode while importing caption files. After you purchase MovieCaptioner it may be used indefinitely. MovieCaptioner is licensed per user, so if more people are going to use MovieCaptioner you will need to purchase additional copies. “If you are in the same situation I was in a few months ago when I first found out that I had to include closed captioning for your video content, you are overwhelmed with information and shocked at the cost of doing this. My first knee-jerk reaction was to call upon other producers to ask how they did it. All of them used a third party service. You’d ship them your videos (digital or tape) and they would pay a transcriber to listen to every spoken word in your content and type those words into a software program that matches the time code of your video. A very daunting task, indeed. I started looking into these services only to find prices that ranged $100-200 per 22-minute episode. Factor in the cost of shipping, your media, and the number of videos you have (in my case it’s 12 per season). That’s an extra $2,000 or more just to meet a FCC requirement for broadcast. If you’re on a budget too, this isn’t easy to stomach. Also consider the turnaround time is slow when relying on an outside service. “I'm so sorry it took me so long to respond to you, but I just wanted to let you know that the new version you sent to me where I could could drop-frame did the trick and I was able to caption perfectly after that. Thanks again so much for your help and excellent customer service! Lifetime Upgrades Just wanted to thank you of posting this software and your blog pages on this software. What a great idea for someone to earn some extra money. Appreciate the lifetime upgrade policy as well. Can you post where your blog pages are describing this. Also, this would be great for the hearing impaired I assumed. Lifetime Upgrades When you develop the PC version of this software, are you going to allow the Mac license to transfer over or will it be a separate purchase? Patrick Besong That will be a separate purchase, however, I will probably allow previous purchasers of the Mac version to get it at a discounted price. Lifetime Upgrades Thank you for the support. Quick and responsive. Patrick Besong Windows version is also available now as well. There are many more, too! Patrick Besong The discount link is fixed now.